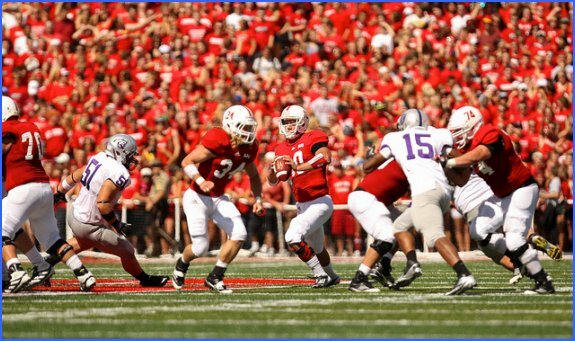 COLLEGEVILLE, Minn. – New Saint John’s University head football coach Gary Fasching and the Johnnies will open the 2013 season with a 7 p.m. game Friday, Sept. 6, at Wisconsin-River Falls. SJU returns home to host Wisconsin-Eau Claire on Saturday, Sept. 14, and begins the Minnesota Intercollegiate Athletic Conference (MIAC) schedule at St. Thomas Sept. 21. Four more opponents visit Collegeville, including Concordia-Moorhead for Homecoming Sept. 28 and Augsburg for Family Weekend Oct. 12. The Homecoming game is the first for SJU against the Cobbers since Oct. 13, 1984 (W, 13-9). The Johnnies end the 2013 regular season with back-to-back home games against Hamline (Nov. 9) and Bethel (Nov. 16). The season opener at River Falls is the first Friday-night game, at an on-campus stadium, since Oct. 1, 1965, at St. Thomas. An estimated crowd of 6,100 spectators witnessed the Johnnies earn a 10-0 shutout of the Tommies at O’Shaughnessy Stadium en route to a perfect 11-0 record and the program’s second national championship. (ST. PAUL, MN) – Three games into the young season that is the 2013 season, the first line featuring Wild Captain Mikko Koivu, last year’s big gun acquisition Dany Heatley, and this year’s addition of Minnesota native Zach Parise have been carrying their weight as far as offensive production goes. With a total of 18 points (6 goals, 12 assist), the big line as accounted for 10 of those points (4 goals, 6 assists) with 2 of the goals and 2 of the assists coming on the power play. The key to the success of this line is that they are together on regular shifts and on the power play along with Ryan Suter and Matt Cullen on the blue line. Although having 5 lefties on the ice at the same time may be a red flag, the line is getting more comfortable with each other every shift that they skate together. “From a chemistry standpoint, guys are coming back. How nice is it for a line to go out and score a power play goal or even to have some great movement, a couple shots, or even some momentum, and they come back to the bench and their talking about it. That’s going to carry on into their next shift as well” said head coach Mike Yeo after the teams opening night win against Colorado. Putting them together on the power play as well as regular shifts also helps in the energy department. “If guys are on different lines then all of a sudden you draw a power play, a lot of times you got a tired guy goin’ on the ice. So, if they can be on the same line it does help in that regard” Yeo said. After watching the trio throughout the first three games of the season, you can see a chemistry building which is something to be expected with guys like Parise and Koivu who are notorious for outworking everybody on the ice. Then you have a guy like Heatley there ready to put the puck home, which has been the line’s M.O. over the first three games. Heatley has 3 goals over those 3 games. “You put Mikko with him and Heater’s a great player and he’s even a better with Mikko, then you add a guy like Zach and that just compounds”, coach Yeo said. The three know that they still have some work to do. “I think we can still be better 5 on 5. I think we can spend a little more time in their zone”, Parise said. “Stop trying to be fancy. We will definitely get better”. “I think we are all hungry to get better”, he continued. – Rookie Mikael Granlund netted his first goal as an NHLer, and with the talent this kid has, it definitely will not be his last. – Josh Harding recorded a shutout in his first start of the season against Dallas which was also his first game since being diagnosed with MS this summer. – Zenon Konopka has already amassed 12 penalty minutes and 30 stitches over the first 3 games and said he would drop the mitts if needed, even with the 30 stitches in his face…man’s game. ST. PAUL, MN – It was a night of firsts for the Minnesota Wild as most opening nights are. It was the first regular season games in a Wild sweater for Zach Parise, Ryan Suter, and Mikael Granlund. Granlund scored his first NHL goal. Parise got his first points as a member of the Wild. Zenon Konopka dropped the mitts for the first time as the Wild’s tough guy and gave the fans a good bout against the hated Cody McLoed. 307 penalty minutes in 2010/11? I think I will like this guy. The X was packed with well over 19,000 fans in attendance for the LONG awaited season opener and it was not long for them to show how happy they were that hockey is back. That was before they sat through the first period. The 1st was a sloppy mess with only 5 shots on goal for the Wild opposed to 12 for the visiting Colorado Avalanche. It was evident that there will be a feeling out period with this team that really looked out of sync in the 1st. John Mitchell scored the first game of the young season putting the Avs up top roughly 2 minutes into the game and they should have went up more but missed 3 open nets. The 2nd period was a time of reckoning for the Wild with crisper play, and a tie game after 3:26 when Dany Heatley netted his first of the year from Parise and Mikko Koivu and less than a minute later, Granlund put the 1st of his career in on a tip from Jared Spurgeon. Although the Avs came back to within one in the 3rd, Pierre-Marc Bouchard sealed it with less than 2 minutes left to bring the Wild back up by 2 after getting stone walled on a breakaway in the 2nd by Avs goalie Semyon Varlamov. Heatley was stopped before he had a chance to get the hatter on the open net following Bouchard’s sealer. I overheard Michael Russo, my sports writing yoda and Wild beat writer for the Star Tribune saying that Wes Walz called it to a T. Slow start with the Wild coming back with the win. It’s a short yet long season and the 1st one is in the books with a lot of great hockey to come, so let’s let the hockey loving festivities begin. On a side note, Greg Zannon’s beard is still glorious. There’s no question the 10-6 Vikings exceeded expectations this season after taking the last NFC Wild Card spot by beating the 11-5 Green Bay Packers 37-34 on Sunday at Mall Of America Field. Many football experts predicted an equivalent record of 2011. Even ESPN’s John Clayton stated the Vikings would finish 2-14. Ultimately the Vikings didn’t exactly shine all season and in some cases barely played well enough to win. However they did win and has shown some promise of what we can expect in the near future. 1. 2012 NFL Draft – Head Coach Leslie Frazier and GM Rick Spielman had an exceptional 2012 Draft. There were a lot of questions picking K Blair Walsh in the 6th round but Walsh was a key in several of the Vikings victories this season and kicked the last second field goal to lift the Vikings over the Packers to put them into the playoffs. Walsh kicked an NFL record 10 FG’s over 50 yards this season and was named the NFC’s kicker for the Pro Bowl. Number one pick, OL Matt Kalil had made a few mistakes this year but chalk that up to the learning curve. Overall Kalil has been outstanding in his rookie year. The Vikings saw something in Safety Harrison Smith by trading up to the first round to grab him. Smith has played well all season and cemented himself into the starting backfield. Corner Josh Robinson has also had a steady season and is showing he has the ability to be a permanent starter. With the injury to WR Percy Harvin, Jarius Wright has shown some flashes of talent as well. We would have loved to see what Wright’s college teammate at Arkansas Greg Childs could have done in 2012. In the off-season the Vikings also signed TE John Carlson to a 5-year / $25 million contract that hasn’t exactly panned out this season. Fourth round pick TE/FB Rhett Elleson has shown his offensive ability this year as well. 2. AP “All Day” – Running back Adrian Peterson has almost single handedly carried the Vikings offense on his back all season long. After a remarkable recovery from a severe knee surgery and reconstruction during the off-season, AP has contended for the NFL MVP this season after running the Vikes into the playoffs and from falling just 9 yards short of Eric Dickerson’s 1984 single season rushing record of 2,105 yards. AP hasn’t been shy of his bid for MVP and has come out to state that he’s gunning for Dickerson next year. It’s given fans something else to cheer for in 2012 along with the hopes AP can continue throughout the playoffs. 3. The Vikings wouldn’t have won on Sunday if it wasn’t for QB Christian Ponder and the clutch throws he made down the stretch. After a hot start to the season the, “serviceable” Quarterback fell into a severe slump and ultimately single handedly took the blame for the 1 – 4 stretch mid season. One can blame lack of targets and some breakdowns in protection for some of the issues but overall Ponder’s play was far from average. Minnesota came back winning four straight games to end the season with one of Ponder’s best performances in the final game against Green Bay. Hopefully this is the sign of things to come for Ponder. Many aspects of the Vikings game has improved over the stretch into the playoffs. The defense has had a philosophy of bend don’t break has come on as well as a much improved secondary. While fans are wishing for a Super Bowl title, Minnesota has exceeded all expectations this year and has put together an unlikely season. We can only hope for the run to continue. Saint John’s University (Minn.) named Gary Fasching, a 1981 SJU graduate, its head football coach on Friday, Dec. 28. Fasching (FAH-shing) becomes the 16th head coach in the 102-year history of Johnnie football and replaces John Gagliardi, who announced his retirement Nov. 19 following 60 seasons at SJU. Fasching ended his 17th season as an assistant football coach and recruiting coordinator at SJU this fall. The Johnnies posted a 164-39 record (120-22 MIAC) with 10 conference titles and 12 postseason appearances (22-11 playoff record), including the 2003 national championship, 2000 national runner-up performance and four national semifinal games during his tenure. “It goes without saying that Gary Fasching’s football credentials speak for themselves,” said Michael Hemesath, SJU president. “Coach Fasching’s experience with building a winning program at Cathedral High School, as well as providing an excellent experience for our student-athletes in his role as an essential part of the Saint John’s program are completely in keeping with the legacy of John Gagliardi. This consistency is probably no surprise as Gary was coached and mentored by John. Seventy-two Minnesota High School All-Star game participants have attended Saint John’s during Fasching’s tenure as the Johnnies’ recruiting coordinator. Eleven SJU defensive linemen earned a total of 15 All-America honors during his 16 seasons as the program’s defensive line coach before switching to linebacker duties in 2012. “We are thrilled that Gary has come through this ultra-competitive search process and earned the head football coaching position here at Saint John’s,” athletic director Tom Stock said. “Gary has worked diligently the past 30-plus years to put himself into this role. Fasching also serves as the University’s McGlynn Fitness Center director and coaches the SJU throwers as an assistant with the track and field team. The Johnnies collected three All-America honors, including one national championship, and 10 conference titles under his guidance. SJU has won the MIAC discus championship each of the past four seasons. Prior to joining the Johnnies’ coaching staff, Fasching served as the head football coach at St. Cloud Cathedral High School from 1986-95, where he led the Crusaders to the State Class B title in 1992 and 1993. A three-year starter for the Johnnies at linebacker from 1978-80, graduated from SJU in 1981 with a degree in social science. He earned his master’s degree in sports management from St. Cloud State University in 2000. Fasching and his wife, Cindy, have five children and reside in St. Joseph. What has become one of the state’s premiere holiday hoops tournament again delivers in 2012. The two-day tourney runs from December 28-29 at St. Cloud Apollo High School. Top teams and athletes again invade Central Minnesota for the holidays. For the second year in a row Minnesota’s top basketball recruit, Apple Valley’s Tyus Jones again will be on display. This event is once again sure to pack the Apollo gym. Catch the action again this year on AM 660 The Bear.